Between now and Disney World’s 50th anniversary in 2021, WDW’s second park is going through a massive change. Epcot’s announced slate of upcoming attractions include a massive Guardians of the Galaxy roller coaster, a trackless 3D Ratatouille ride, and a state-of-the-art nighttime spectacular set to replace Illuminations. When a new vision for Epcot was announced by Bob Chapek at D23 2017, he promised that this update to Epcot will include a fresh new look for Future World, but we’ve been left in the dark as to what that would exactly mean. 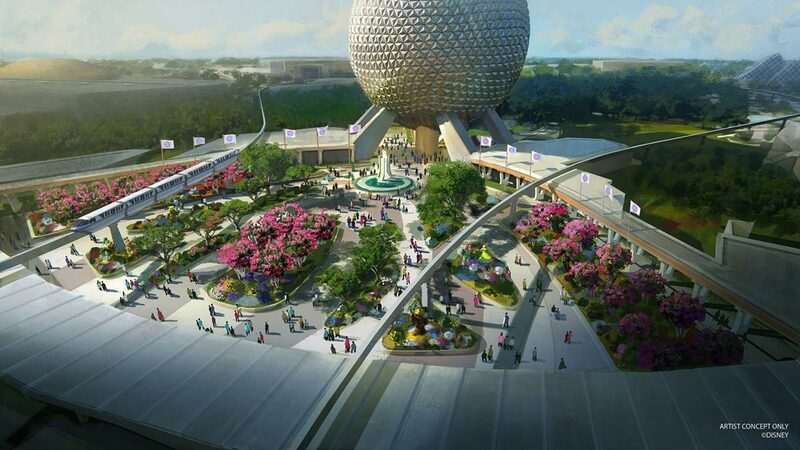 Disney recently revealed two new tantalizing details coming to Epcot: A brand new pavilion and a gorgeous reimagined entrance for the park. Pictured above, the Play Pavilion will be located in the former Wonders of Life building, which has been recently used as a festival center for Food & Wine and Flower & Garden. This new pavilion promises to provide guests with unique interactive experiences featuring their favorite Disney characters. From the concept art, it looks a little like the OhMyDisney site from Ralph Breaks the Internet, with a ton of glowing signs and Disney IP everywhere. A recent episode of The Disney Dish with Jim Hill shed a bit more light on the nature of this pavilion. The idea for the Play Pavilion stemmed from a concept of a “black box” attraction, where Disney could use technology like VR to easily mount rides that would run for a limited time. Miss Mr. Toad’s Wild Ride at Magic Kingdom? Disney could use this concept to put up an experience that recreated Mr. Toad for a few months. According to Jim Hill, the Play Pavilion will feature temporary attractions that would tie into the latest Disney movies and Disney+ streaming releases. The hope would be that each time you visit Epcot, the Play Pavilion would provide a completely new experience. Part of this sounds like the promise of Innoventions, but with the ability to be more rapidly updated and with more Disney synergy. Disney also revealed a new look for Epcot’s entrance. While I’m intrigued by the new Play Pavilion, this concept art left me downright giddy. It’s much more lush and shaded than the current entrance, with a nod to the early days of the park with the fountain in the middle. The polarizing Leave A Legacy pictures will be moved to just outside the park’s entrance. If new permits are to be believed, all of these new developments will also mean impending closure for Innoventions, Club Cool, and the Fountainview (aka Starbucks), most likely over the next few months. There’s no word on the future of these Future World institutions, but stay tuned.